Acting Defense Secretary Patrick Shanahan lamented the ship has "poor and unknown reliability," the late Sen. John McCain called it "a spectacular debacle," and the Project on Government Oversight called buying two of them at once "acquisition insanity." But now the US Navy has gone and done just that: Huntington Ingalls got a $14.9 billion contract to build two more Ford-class aircraft carriers, according to a US Navy contract announcement issued Thursday. 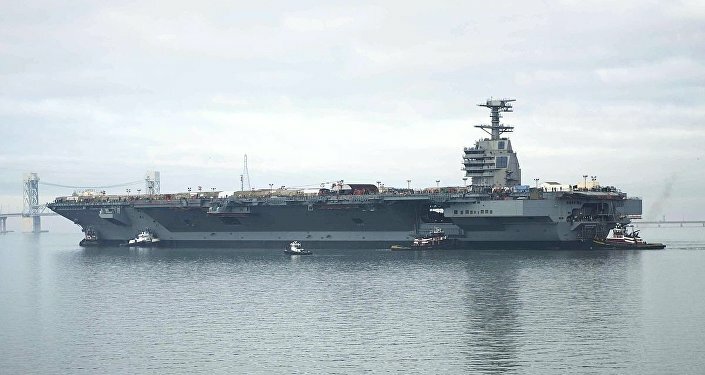 The two 100,000-ton super carriers will be built at the company's shipyards in Newport News, Virginia, and are expected to be completed by February 2034, according to Stars and Stripes However, a Congressional Research Service report from October 2018 said the first ship, which has already been named the USS Enterprise, would be delivered in September 2027, and the second one, for now known only as CVN-81, would be delivered by September 2032. The total price is projected to reach $24 billion once it's all said and done, as some costly systems such as the EMALS electromagnetic catapult system are added to the bill, USNI noted. That sounds a bit generous, given that the first ship in the class, the USS Gerald R. Ford, is 20 percent over budget, running up a bill for the Navy to the tune of $13 billion just by itself. Senator Jim Inhofe (R-OK), chair of the Senate Armed Services Committee, has repeatedly expressed his skepticism of the dual ship buy, especially since several key problems with the USS Ford haven't yet been ironed out. For example, the ship was delivered without working weapons elevators. "They spent most of their time down there telling me what a great thing" the carrier is, "and I'm sure it is," he said in December, "but still, the elevators still don't work." Only last week did the Ford finally get one working, Sputnik reported. "The elevators will be ready to go when she pulls out or you can fire me," Spencer reportedly told US President Donald Trump in late December, according to USNI. All 11 of the Ford's munitions elevators are expected to be working by the summer of 2019. Spencer has touted the benefits of a block buy, predicting as much as $4 billion in savings on the deal inked Thursday, Bloomberg reported. Likewise, Rep. Rob Wittman (R-VA), in whose district the Hampton Roads shipyards are located, hailed the deal as a budget-saver and an economic boon. "This dual buy means even larger savings than projected for taxpayers and the certainty that our industrial base needs to retain and hire the employees who create the highest quality products for our sailors," Wittman said in a press release Thursday. "For Virginia it means thousands of reliable jobs and community development for the next decade and beyond. As one of the largest Navy shipbuilding contracts ever, I am proud to have led this effort and look forward to its success." The Ford ships are to be the US Navy's replacement for the aging Nimitz-class carriers, which have been the backbone of the service since the 1970s. The second ship, USS John F. Kennedy, is presently under construction. The ships ordered in Thursday's contract will be the third and fourth ships of what is expected to become a 10-ship class. The Enterprise will have its keel laid next year. The Fords implement a number of new designs and technologies, some of them relatively untested. The ship's electromagnetic aircraft launch system, EMALS, was only tested for the first time in 2017, and an internal Pentagon report last month lamented the ship "will probably not achieve" its expected launch rate of 160 sorties per 12-hour flight day, noting that such projections assume perfect conditions and a lack of technical problems. Trump once maligned the EMALS system as something "you have to be Albert Einstein" to work properly, but it's still more efficient than the Nimitz-class' CATOBAR steam catapult launch system, which can launch 120 sorties in 12 hours. However, the final Nimitz-class ship, the USS George H.W. Bush, cost the Navy a mere $6.2 billion. The Congressional Research Service report cited above notes that twice before, the Navy has made double-carrier buys: in 1983, when it bought the USS Abraham Lincoln and USS George Washington together; and in 1988, when it bought the USS John C. Stennis and USS Harry S. Truman in a single contract.